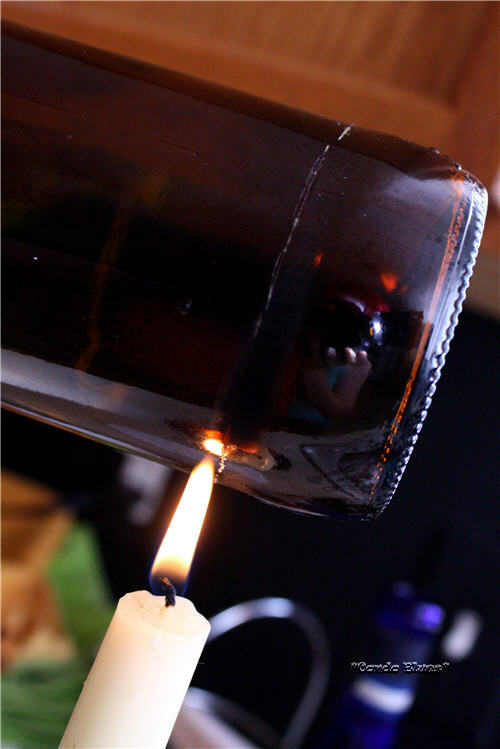 I get better luck when I use the candle method I used in my tutorial How to Cut a Wine Bottle Perfectly Every Time. Unfortunately it is also messy because the bottle gets covered in soot from the candle. I experimented and found an even better, cleaner, and less fire hazardous way to cut a glass bottle. I am going to use the power of Science and a tea kettle. Yes you can cut glass with hot and ice water! If I haven’t cut a glass bottle in a while my first few bottles sometimes have a broken edge. I think it is best to have extra practice bottles or jars on hand and cut a few of them first because every bottle or jar has its own unquiet features, thickness, angle, etc. Sometimes I can save the wonky breaks with extra sanding and sometimes not. So it never hurts to cut a few practice bottles because cutting your only fancy/unique bottle you want to use for your wine bottle project. This is why you will see a series of bottles in this post. 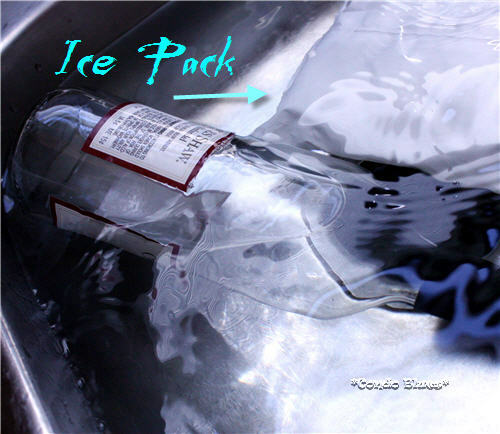 Bucket or sink full of ice water as cold as cold can be - I use a reusable freezer ice pack like this one because it doesn't melt as quickly as ice cubes. 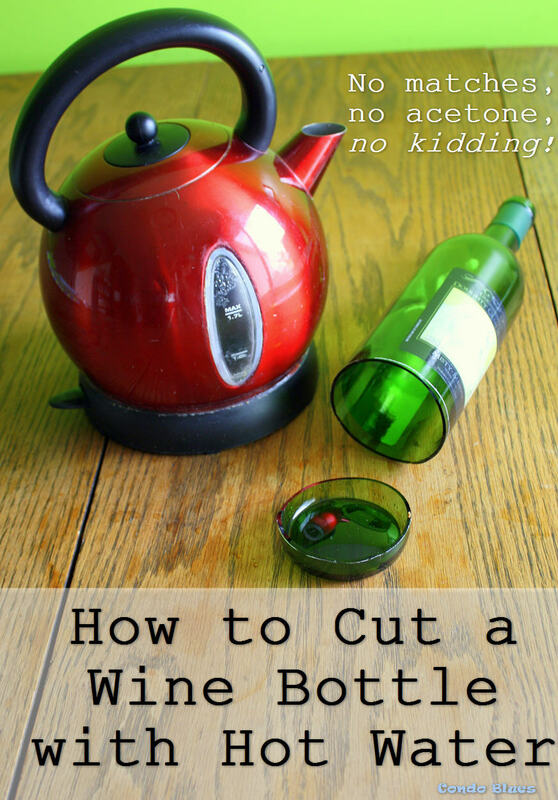 Very handy when you are cutting several bottles! 1. 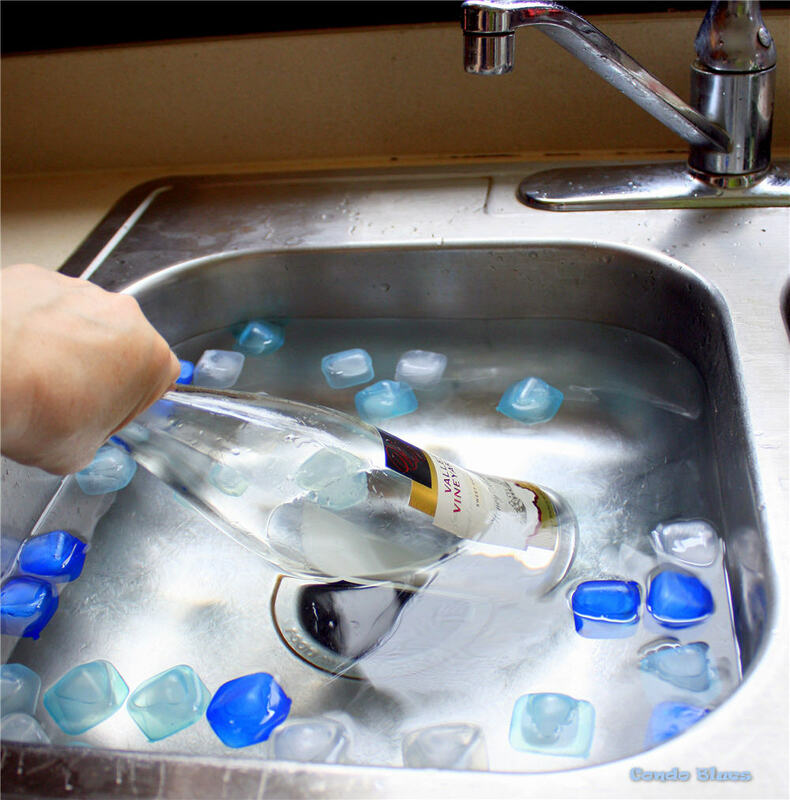 Remove the label from the glass bottle or jar. 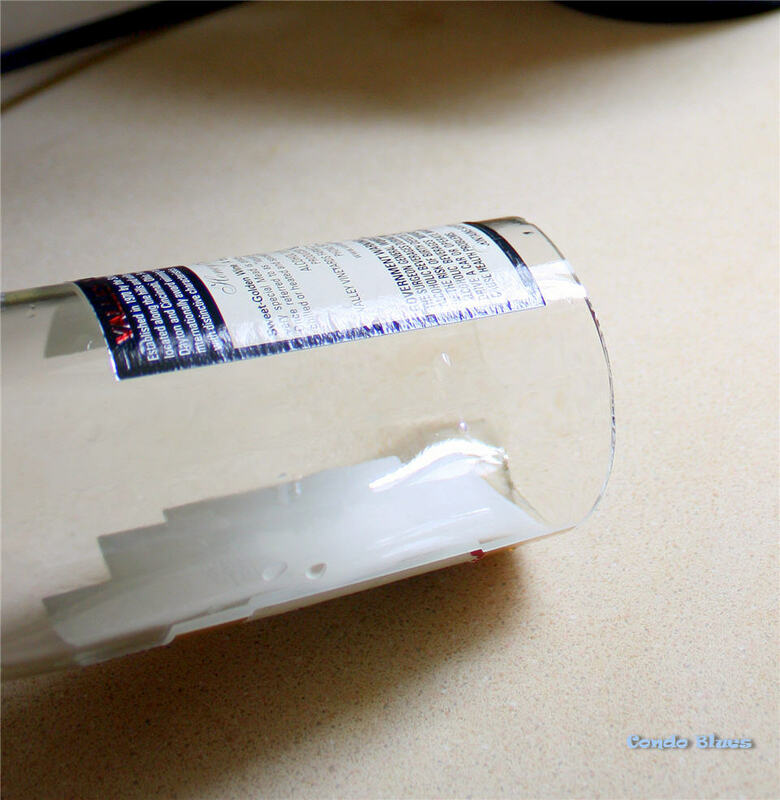 If try to do Step 2 through the label you will end up scoring the paper label and not the glass underneath.You need a solid score line around the glass bottle for it to break. Trust me on this one. I left the labels on my wine bottles because I am cutting the bottom off my bottle below the label. Your mileage may vary. 2. 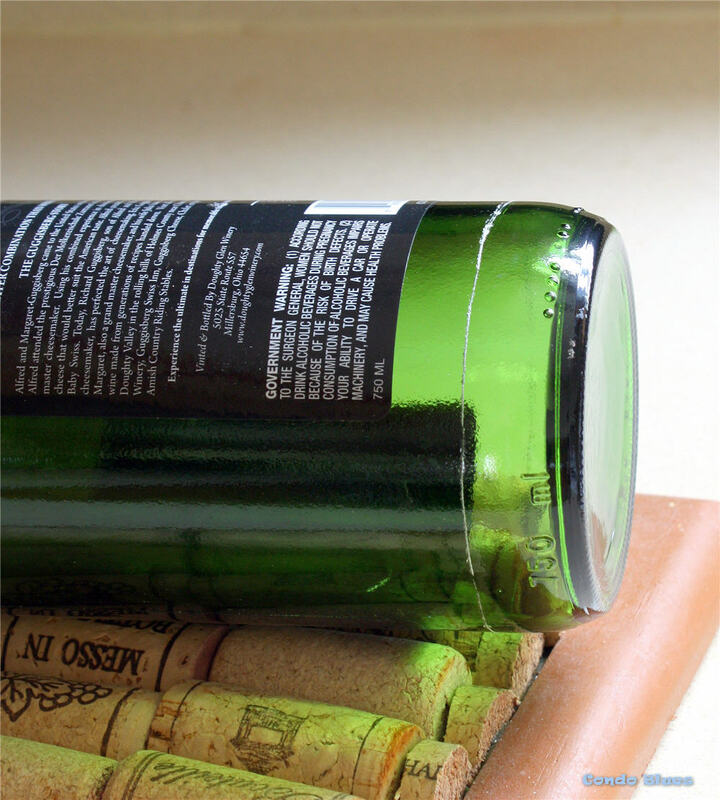 The best way to ensure a clean (or cleaner, because cutting bottles is not an exact science) cut is to lightly and evenly score the bottle using the bottle cutter using one rotation only. This is where bottle cutter kit is your best friend. There are cheaper ways to score a glass bottle before cutting it but they make it more difficult to make sure you have an even and level cut line. Generation Green (g2) Bottle Cutter - a variation of the Armour kit. They all basically work the same and the type you buy really comes down to preference. I am using the Ephraim bottle cutter in this tutorial. It is my favorite. Tips: I always get a better break from a light score line on the bottle than when I smash the bottle into the cutting wheel to make a deep score line. If you have little gaps in your score line it may lead to a chunky cut. If you go over the score line more than once, you might get a chunky or useless cut. I learned the hard way, don't be me. 3. Heat water in the tea kettle until it is boiling hot. 4. Fill a bucket or sink with cold as possible ice cold water. I add as many reusable ice cubes and cold packs to the water as I can because the water needs to be super super cold. 5. Carefully pour the hot teakettle water over the score line on the bottle. 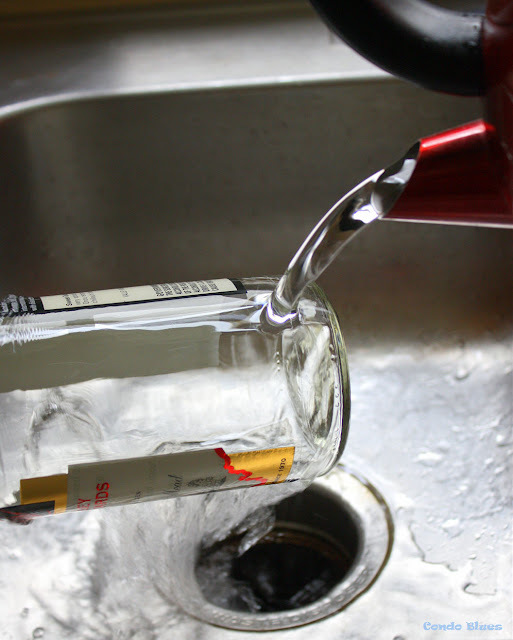 Be sure to rotate the bottle as you pour water over the score line. The goal is to get the bottle as hot as possible. This is were having a double sink helps. Do not do Step 5 over your cold water bucket. 6. Immediately plunge the hot bottle into the ice water. With your mighty Science Powers the stress from heating and cooling the glass will make the bottle crack and break long the score line. This may not happen the first time out. Repeat Steps 3 - 6 as many times as necessary until the bottle breaks a long the score line. Warning: Be very careful handing the edges of the bottle. Cut glass is sharp! You just glass bottle using science! Excellent posts. There is certainly a trick to how to do this, that is for sure. Thanks for sharing at the Snickerdoodle Create Bake Make Party. Found this blog through pintrest. Love the way you write, and thank you very much for the insight!